Authorities tell us that we can control our body weight by counting our intake of Calories and our energy expenditure. This is the so called Calories In Calories Out (CICO) theory. They even give us numbers: one pound less per 3,500 Calories deleted. How can this theory be wrong if they can give us the detailed amount of weight we will lose, as a function of the Caloric deficit we make? The facts. What does experimental data say about the CICO theory? In this scientific study one group of subjects kept a deficit of 500 Calories/day for the last 18 months of the study. That is an aggregate deficit of 270,000 Calories. According to the CICO paradigm they should have lost 77 pounds. They gained 4 pounds during those 18 months. CICO theory says they should have lost 77 pounds, but instead they gained 4. You don’t believe me? Check the study and do the math yourself. 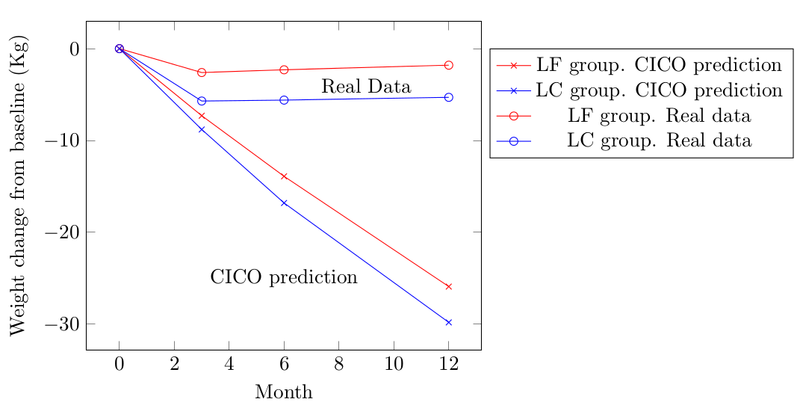 The CICO theory predicted a weight loss of 25-30 Kg after 12 months. Real weight loss was 2-5 Kg. Are you still not convinced about the CICO model being useless? Ok. In another study, for 12 weeks group A ate 300 Cal/day more than group B, but their diets were different. Group A had an extra 25,000 Calories, and they lost 3 pounds more than group B at the end of the study. 25,000 more Calories eaten, 3 more pounds lost. The CICO theory says they should have lost 7 pounds less, not 3 pounds more. How is this insanity even possible? nobody checked out the CICO model before making it public policy? Homework: can you tell me how does an adipocyte (fat cell) know we are eating too much and doing little exercise, so it can decide to store fat instead of releasing it? What is more fattening, 100 Calories of butter or 100 Calories of bread?